There are majorly two types of formations in the world. The first type is made by considering the natural variables of the world. Once these variables are measured and taken into consideration, one would create a nucleus of the formation, and based on that, the creator would seal the power of heaven and earth into the nucleus in order to create a manmade space. The second type would be a military formation. This was a formation fully composed of human beings, and these type of formations often did not have a set shape. Because of that, these formations could often change shapes, and would be harder to predict because of that. That’s where the power of the military formations lie. The martial artists who were guarding the Grass Shoe Garden. Most of them were first-rate experts. There were also several peak experts planted in the formation who were there to command the others. Un Hui sent out his orders, and began to observe his surroundings. Honestly, he thought that his bet with Cho Ryu Hyang was just nonsensical. Based on his knowledge, unless a person had a strength that rivaled that of the Pope’s, there was no way to break through the formation. Even Un Hui, a person that knew so much about the formation itself, couldn’t. It would be good to teach the boy a lesson using this chance. Even if that boy has immense talent like the Pope described, the boy’s power would only come to fruition in the future. Right now, this boy didn’t have any power. While Un Hui had been imagining Cho Ryu Hyang in a beat-up state, Cho Ryu Hyang slowly inhaled and looked at the people coming at him. After figuring out the basic power of the people coming at him using the Faultless View of The World, Cho Ryu Hyang took another breath and walked forward. Un Hui’s eyebrows twitched when he saw that. He had a bad premonition. He couldn’t tell what it was, but he felt that something was wrong just now from Cho Ryu Hyang’s actions. Right after that, Un Hui began to tilt his head in confusion. That was because Cho Ryu Hyang was just casually walking out of the formation. Multiple swords struck out simultaneously with a bone-chilling sound. None of these swords, however, struck Cho Ryu Hyang. Every single one of the swords missed Cho Ryu Hyang by mere millimeters. Un Hui, looking at that, widened his eyes in surprise. Were his subordinates missing on purpose? Un Hui shook his head. There was no way they’d do that. But for some reason, none of the sword strikes hit Cho Ryu Hyang. It wasn’t that Cho Ryu Hyang was dodging these blades with extreme speed. The boy was simply moving around amongst all the martial artists with strange, slow steps. Sometimes he’d go forward, sometimes backward, then turn sideways. And sometimes, for some reason, the boy would stand in place for a moment, twist his body sideways, then walk forward. Whenever the boy did that, the attacks performed by Un Hui’s subordinates would miss. Was this some sort of sorcery? There was no way to explain this scene without calling it sorcery. That was because Cho Ryu Hyang’s movements didn’t contain any kind of pattern at all. Forget about first-rate experts. Even peak experts were unable to even leave a scratch on the boy. Just how was this happening? And besides that, there was something even more troublesome happening. Little by little, the formation was crumbling. The formation was starting to break while trying to match Cho Ryu Hyang’s movements. When Un Hui noticed that and frowned, Cho Ryu Hyang staggered a little as he bowed down. At the same time, a single sword through the spot where Cho Ryu Hyang’s body had been. Un Hui was about to stop his subordinates, then paused. His subordinates were beginning to act impatiently. That sort of thing could break the entire formation even faster. But……. Un Hui’s eyes sparkled. Cho Ryu Hyang’s clothing was but normal. This was good. And with that just now, Un Hui was able to figure something out. Un Hui quickly organized his thoughts after seeing Cho Ryu Hyang’s body, which was drenched in sweat. He didn’t know much about what that brat was planning on doing. To be honest, he didn’t have a clue. But he knew that this boy in his eyes was clearly exhausted. It was obvious when he heard the boy’s rough breathing, and saw the sweat glistening on the boy’s body. Things will be different starting now. After all, he figured out a way to deal with Cho Ryu Hyang. Unlike the Attack stance, which focused on keeping everything in order, the Undoing stance would grant each martial artist a designated area, an area in which a martial artist could move around freely. In such a stance, the formation would naturally begin to break by itself. Just now, the attack that barely managed to touch Cho Ryu Hyang was a random attack performed by one of his subordinates. Cho Ryu Hyang clearly became agitated at that moment. When Un Hui saw that, he realized that the answer to defeating Cho Ryu Hyang lay there. That boy almost reached the edge of the circle that was drawn on the ground. But for some reason, the boy wouldn’t go across the circle. While Un Hui had been making a confused expression, Cho Ryu Hyang had been biting his lips out of anxiousness. Cho Ryu Hyang’s face was beginning to show a trace of agitation. The idea to use the Faultless View of The World in order to face the formation was good. When Cho Ryu Hyang used the Faultless View, he was able to see the entire shape of the formation just by glancing at a single person. Using this, going through the formation was like solving problems while knowing the answer itself. He was able to tell exactly where the next attacks would be. Thanks to that, he was able to dodge the attacks coming at him just by observing the tiny movements from a single person. With this method, he was able to dodge the fast attacks with slow movements. But at this point, he was unable to move as easily as before. Even when he used the Faultless Vision, he was unable to see the exit. Even when he neared the edge of the circle, he was unable to move outside. The Faultless Vision showed that there were no exits in front of him. That meant he was unable to exit the circle with just a single move. Then there was only one other option he could take. It was quite troublesome to move around the circle again, inside the formation. That was because of the oppressive aura that constantly pressured Cho Ryu Hyang’s body. It felt like he had lead bars strapped to his legs whenever he took a single step. Cho Ryu Hyang could begin to taste blood in his mouth. An untrained body. That untrained body of his was beginning to show its limits. It would be hard starting now. He had to get out of the formation before his strength left him. Suddenly, the feeling of oppression that surrounded Cho Ryu Hyang began to thin. His body began to feel lighter. But Cho Ryu Hyang’s expression simply got darker when he began to look around. This wasn’t a good sign. He felt something bad from all this. When Cho Ryu Hyang sensed something and turned around, he could see Un Hui standing outside the formation. When their eyes met, Cho Ryu Hyang readjusted his glasses and frowned. His instincts warned him of danger. At this rate, he was going to get caught. In a moment, a net specifically designed to capture him would be created. Did he use too much time? Of course, that must’ve been one of the problems, but Cho Ryu Hyang found that the root of the problem lay elsewhere. If the Administrator was in the formation, he would’ve failed to notice that the formation was being destroyed. But the man was observing the formation from the outside. Because of that, he was able to get a good look at the entire formation. He had found Cho Ryu Hyang’s weakness, and changed the formation in order to target Cho Ryu Hyang’s weakness. He didn’t know how the boy managed to move around the formation like that. It seemed like the boy had a special method or skill, but that didn’t matter anymore. His subordinates will now take up their respective area and guard it, in order to create a perfect net. For Cho Ryu Hyang, a person who didn’t know martial arts at all, this net would be impossible to break through. Did he not confirm the effectiveness of this strategy earlier? Uncoordinated attacks towards Cho Ryu Hyang would surely make their way through eventually. When Un Hui put up a victorious face, Cho Ryu Hyang had to quickly make a decision. He had to find a way to get out before the new stance of the formation was completed. Cho Ryu Hyang had to go through two experts in order to get out of the formation in the shortest amount of time. 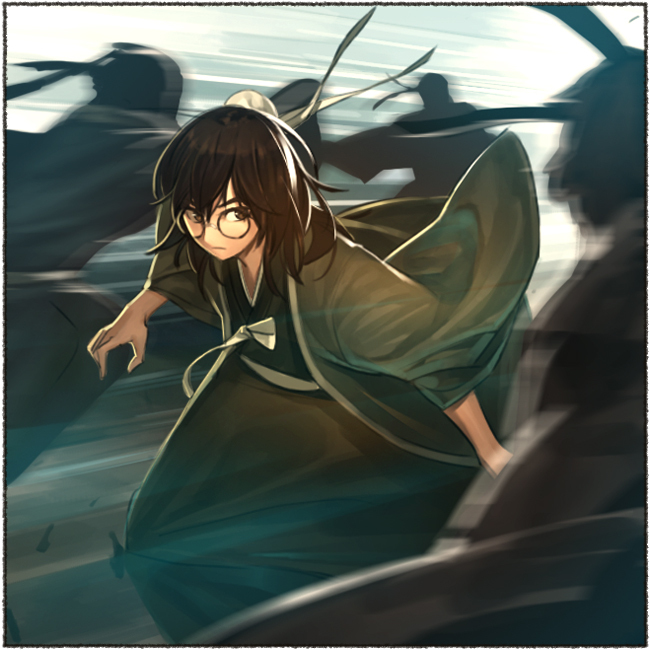 Cho Ryu Hyang deactivated the Faultless Vision with a bitter face. Then, he stood in place and took a deep breath. Un Hui, looking at that, clenched his fist. Un Hui knew what the boy’s expression meant. That was the face a person put on when he/she was not assured of their victory, but could see a chance of winning. Just how would the boy try to get out? Un Hui began to observe Cho Ryu Hyang as carefully as possible, by focusing every one of his senses on the boy. Cho Ryu Hyang exhaled the air from inside his body, inhaled deeply, then stopped moving for a second. Un Hui noticed a small patch of light that appeared inside Cho Ryu Hyang’s eyes. It didn’t look like the boy practiced martial arts at all, so what was going on? Un Hui quickly tried to change the formation yet again, but Cho Ryu Hyang was a step faster than he was. I was waiting for this.Thanks. -runs around excitedly- woah, that was utterly cool—! The image helped with the visualisation, and i can just imagine the scene in my head! Definitely one of my favourite chapters! woo—! Thank you for the update; truly love this novel. Awesome. It’s too bad that he could only see the attacks that were part of the formation. Oh well, he’ll get even more awesome later. WAh!!!! coool so cooool sooo extremely cool!!!!! Thanks so much for all your hard work!!!!! I wonder how the Generals are and the pope are going to feel about Hui and his subordinates’s behaviour? What will our MC do with them huhuhu im excited.